This morning, I checked the Facebook and Twitter accounts for the library. We have the Computer Lab for Academic Use between 2:00 p.m. and 4:00 p.m. today. I also checked some more of the mystery and romance paperbacks from the gifts and suggested a few to be added. I also added a few books on current events to the current events display. I spent some time looking at Techsoup. I also talked with someone about volunteers for the library. I did lots of small things like reminding people to send flyers to the Friends of the Library and the Mount Vernon Public Library Foundation. 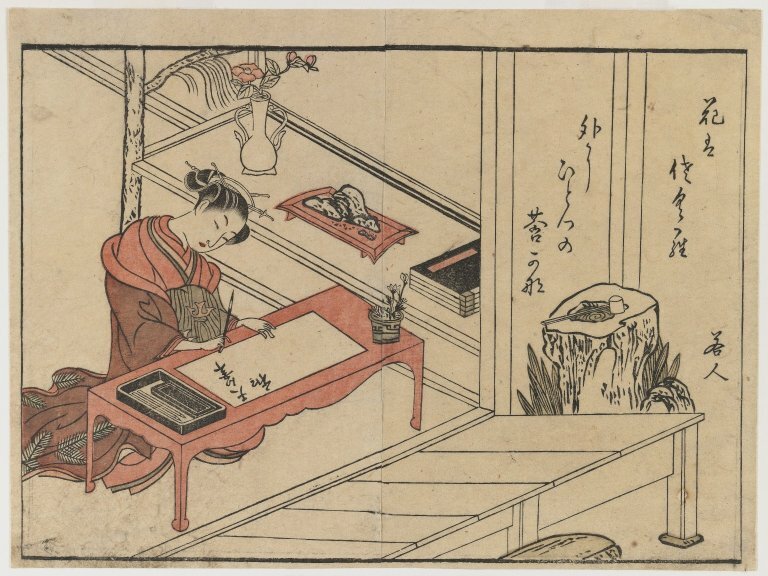 This morning, I updated the Twitter and Facebook pages for the library. I also checked the displays and updated the current events display for the library. I also checked the gift books. There were a few mystery paperbacks which are being added by Kate Collins. I have a couple bags of mystery and romance paperbacks to check. I have a couple issues of the New York Times Book Review, a copy of Publishers Weekly, and a copy of Booklist to read through on my desk. The book, No Shelf Required E-books in Libraries by Sue Polanka has come in for me to read. I started reading the book on the train. 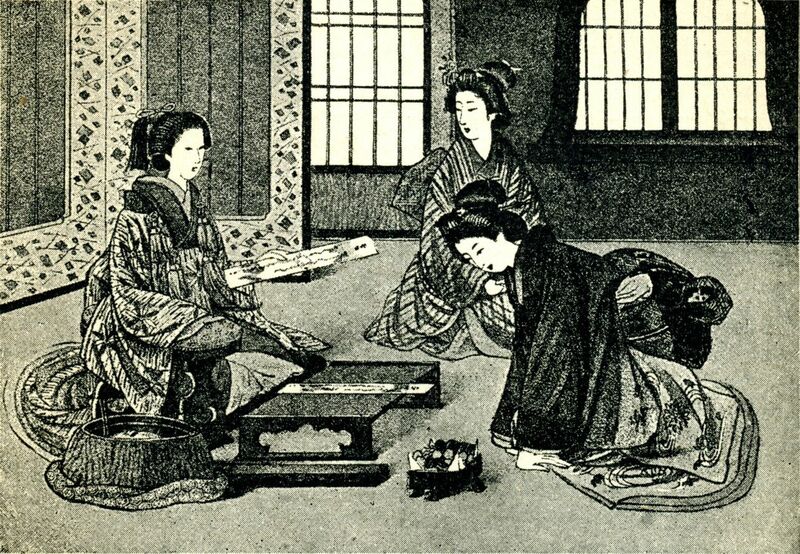 The author is writing about the early history of e-books. 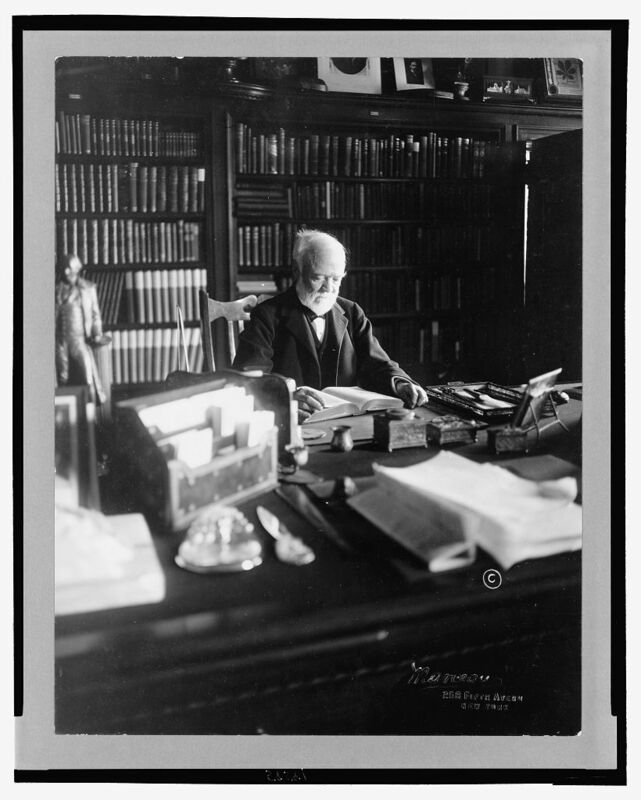 Project Gutenberg and the Internet Archive play an important part in this story. The first e-books were not commercial, they were mainly classics and books that were out of copyright. There are a tremendous amount of free e-books on the internet. There are even some newer computer books http://oreilly.com/openbook/ I also put No Shelf Required 2 Use and Management of E-books on hold as well. I was planning on going to the New York Tech Meetup, but changed my mind. I needed some more time at home. The menus are being worked on the website. Hopefully, we will have a better menu layout for the website soon. It is starting to look better. We have our computer classes tonight. One from 5:30-6:30 P.M. and one from 6:45 to 7:45 P.M.. We are also working on changing the websites menus. They should look a lot better soon. This morning, I checked the Twitter and Facebook accounts for the library. I also spent a few minutes on findings. Right now, I am looking at the IDPF (International Digital Publishing Forum) member list. I am looking at http://www.24symbols.com which claims to be a spotify for books. I am also looking at findings and the settings for the Bookmarklet for my Kindle. I have been interested in content supersites since 2001 when I first saw an attempt to create a content supersite called Contentville. Although the idea of Contentville did not succeed, I have been fascinated with the idea of how to create a content supersite for a very long time. I think about it often. It is why I am so interested in digital publishing. I have always wanted to do something with the internet since I worked for the Globix corporation eleven years ago. I also at one point pondered having a bookstore. I figured out that this would be a challenging way to live. I used to hang out at a now defunct science fiction bookstore for a while. Bookstores fascinate me almost as much as libraries. It is nothing new for me. It has been a steady interest. I have been pondering the New York University publishing program for almost as long. I took the introduction to publishing course eight years ago. Sheree Bykofsky of Sheree Bykofsky Associates was the teacher. I keep on going back to the subject. I have always been a little fascinated by publishing. I am feeling a little more motivated by the program. I visited New Work City http://nwc.co today. I am interested in the programs that happen there. For a while Pearson was a sponsor for the coworking space. That ended a while ago. Recently, they had http://www.book2camp.org there. There are some people in the publishing and apps space there. While I was at Book2Camp, I recognized a number of organizations, Digital Book World, Tools of Change for Publishing, and Library Journal all of whom are involved in the book world. I also stopped by General Assembly http://generalassemb.ly and asked about tours. They do tours of the facility on Tuesday and Thursdays at 5:00 p.m. I also had a chance to walk around the city. I walked past the Strand Bookstore and went to Roger's Time Machine for a bit to look at comics. Part of visiting these places is a sense of keeping my hand in with what I did previously. I very much like working with the internet, books, and publishing just as much as librarianship. I like the idea of entrepreneurship and small business. It is interesting to me. There is a certain magic in risk and taking risks. At the same time, I like librarianship. I spent a few minutes this morning on http://findings.com I am finding it very entertaining. I also updated the Twitter and Facebook account for the library. I bought a copy of What Color Is Your Parachute? Guide to Job Hunting Online, 6th Edition and downloaded it to my Kindle for PC program on my desktop. It should help me focus a little bit better. I also spent some time updating my Linked In contacts. I have to work on expanding my contacts list. This is very much an article for librarians. I spent some time looking at the various aggregator sites like Indeed, Simply Hired, and Link Up. Simply Hired is the best quality of the aggregators. The only site that had anything remotely interesting on it was Link Up. Link Up draws directly from employers websites. Most of the listing I am seeing are very unappealing. I also spent some time on the site I Need A Library Job which is easily the best aggregrator for library job listings. As a note, I contacted I Need A Library Job and found that they use volunteers to compile the listings together and check the listings to see if they are real. I will probably end up using this information on Wednesday and Thursday to help people look for jobs in the computer lab. There is a reminder to think of, people hire people, not people hire paper. There is also an interesting section on electronic portfolios. I could probably add my resume to this blog and call it an electronic portfolio. For some people, blogs like this are better than resumes, they tell a lot more about the person than a resume ever could. I finished reading What Color Is Your Parachute? Guide to Job Hunting Online, 6th Edition. It was a very solid overview of the topic. I think I have a very good idea of what I plan on doing next. 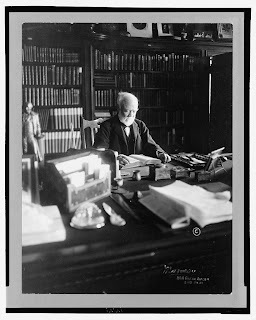 [Andrew Carnegie, 1835-1919, half length, seated behind desk, looking down at book, facing right; shelves filled with books in background] Date Created/Published: c1913 April 5. I checked the Twitter and Facebook this morning for the library. I also finished reading What Color Is Your Parachute? It helped me focus a little better on what I am doing. I still have quite a bit to do. 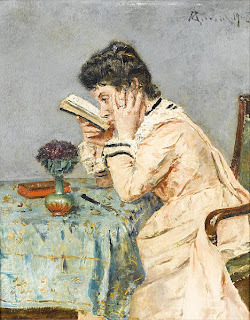 I have been learning a little bit more about social reading and social publishing. This morning, I updated the Twitter and Facebook account for the library. I also spent a little bit of time looking over my Linked In account. I am planning on going to New York Libraries Share on March 18, 2012 which is a networking group for librarians on Facebook. I have been reading some more of What Color is Your Parachute and doing the career assessments. The assessments confirm my desire to work at the crossroads of reading, social media, and content. I also have been looking at social reading sites like Goodreads, Shelfari, Library Thing, Book Lamp, Scribd, Red Lemonade, Open Margin, Wattpad, Bibliocrunch, Bookjar, Book Glutton which has become Read Social, Subtext, Netgalley which is more of an electronic galley service than a social network. I also signed up to try two new Social Reading platforms, Bookish and Flatleaf which have not quite launched. There are also some rather interesting sites which are around like Inkpop- a creative writing site for teens and Cowbird which is a kind of storytelling site. I spent some time earlier this morning looking at Digital Book World, Teleread, the Digital Shift, and O'Reilly Tools of Change. I'll probably take a look at IDPF (the International Digital Publishing Forum) and the BISG (Book Industry Study Group) as well. I am almost done reading What Color Is Your Parachute. I have an idea of what my assessed strengths are and what I am interested in doing. I filled in the flower diagram in the book. Now, I have to start talking to people about different activities. This morning, I updated the library Twitter and Facebook accounts. I also bought a copy of What Color Is Your Parachute? 2012 by Richard N. Bolles. Because it is an instruction book with lots of questionnaires, I wanted a copy so I could write in the margins and fill in the pages. I spent some time this afternoon reading What Color Is Your Parachute? One of the things which the author reminds people is that Google is your resume now and you want to make sure your information on social networks is as complete as possible. I am going back to look over my networks today. It was interesting looking at what was on Google. I think I might have made one risque comment on banana guards, but that is about it. I found listings for Meetup, Scribd, Quora, Visual CV which I hid, Huffington Post, Digital Book World, the Content Strategy Meetup, and the NYC Taxonomy Community on Meetup. I also spent a little bit of time cleaning up my Linked In profile. Maybe some more people will look at it. I have started doing the career and personal assessment exercises in What Color is Your Parachute. I get a sense that I like working with books and information. What I don't seem to like is the increasing instability in libraries that exist because of funding troubles. This is a question which I asked on Linked In. I am thinking that the number of people who have easy access to e-books has grown tremendously. 29% of people have tablets and e-readers. Another 35% own smart phones which can function as reading devices. 78% of Americans now use internet broadband according to pew. The question then becomes what percentage of people are loading e-book software onto their personal digital assistants. Also, who is loading software for e-reading onto their personal computer like the Nook for PC application, Kindle for PC application, or Overdrive Media Console. If 30% have dedicated e-reading devices and you hazard that people might prefer to read an e-book on their laptop or phone, would it be close to 50% of people having e-reading devices or software. This is a wild guess. Any thoughts. The Argentine Book Tank: Book Mobile for the 21st Century? TOC 2012: Barbara A Genco, "Public Library Power Patrons Are Your Best Customers"
Jonathan Basker did a talk on getting hired in the startup world. It was very different from what I expected. This was his first talk at General Assembly. The meeting ran past the allotted time of 8:00 p.m. to 9:30 p.m. to a bit past 10:00 p.m. The talk was both excellent and sold out. I forgot my notebook so I am going to write what I saw and heard from memory. As always, this is my interpretation of events. I arrived at the General Assembly building on the 4th floor of 902 Broadway, a little bit past 7:00 p.m. and took a short walk around the neighborhood. I came back at 7:45 p.m. The meeting was held in the media room. The last meeting at General Assembly I attended was in the library. I was one of the first people in the room and had a chance to ask a few questions before the session started. I learned that Linked In was the tool Jonathan Basker used the most to find people. The talk started with Jonathan Basker giving his background as a recruiter. He worked for a recruiting company in Seattle recruiting for small startups, then moved to becoming a recruiter for Etsy, and now is the VP of People for Betaworks which is a recruiting and angel investing firm. In a way, I can relate to this. In 2000, I worked for the Globix corporation as a sourcer finding people in an internal recruiting department for a year. It was a very different. I learned a lot about how the internet worked and how people connected to each other through the internet. It is not something I would want to do again, but I can relate to the experience. There are librarians who work in some of the larger recruiting and outplacement firms. Many of them are members of the Executive Search Roundtable. The talk was very much an open discussion with the audience asking a large variety of questions. There were developers, an intern, some people from the banking industry, a person who worked at Neverware, an internet community manager, an iPhone app developer, some people seeking to get into product management, and a variety of other people. The room was completely full. I liked how Jonathan Basker described many different aspects of the hiring process. Some of his suggestions like simply saying hello, instead of a formal introduction on your cover letter were a bit different. He described how startups were very personal because of their small size. The best way to get hired was to know people inside the company. The first choice was to know someone who worked in your company of choice, the next best way to apply was to network your way into a company, and the least desirable way to apply was to apply through a resume sent in blindly. One of the reasons for me going to these things is to see people who might be in a similar situation to my own. When I cover the computer lab, I sometimes help people apply for jobs. One of the things that happens is that people who are looking for jobs share job openings with each other. A group opportunity opens up more opportunities to find things and get feedback. On a personal level, Jonathan Basker said he never got a job through using a resume. This is very different from my own experience. I applied directly to the jobs I wanted and got the positions. I have been wondering for a long time the best way to get a job without using a resume. I am not seeing the kind of job I want on a job board. Jonathan Basker describes the hardest kind of job to get is one that you create yourself. At the beginning of the discussion, he asked how many people were actively looking for a job in a startup. Quite a few people raised their hands. Some people were considering working in a startup. It was different. I feel a bit ambivalent, I am interested in entrepreneurship, specifically social reading and social publishing. Things like Librarything, Shelfari, Goodreads, Red Room, Red Lemonade, Copia, and other places. I like reading the Tools of Change for Publishing linked in group and the Digital Shift from Library Journal. I am just not quite sure how to approach this. It is all very new and a bit disconcerting. There were questions about how people can prepare for going from being at a bank as a developer to being a developer at a startup. Jonathan Basker suggested that developers join the various Hackathons at General Assembly and through Meetup. It was very important to go to Meetups and events to meet people with similar backgrounds. Jonathan Basker suggested that we use the PAR method for interviewing. PAR stands for problems action results. We should go back through our career and write down where we succeeded in solving problems. This would help us tremendously with interviews. He also suggested that we take the time to relate our experiences to the job we are applying for. Take the time to write it all out. Meetups are something I can relate to very well. I was at the New York Librarians Meetup last night talking with Stephanie Gross the leader of the meetup. Jonathan Basker is absolutely correct in saying that recruiters are going out to meet people at events more than just looking at resumes. 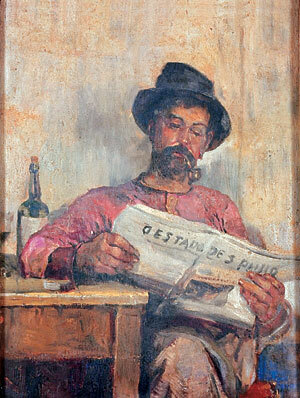 One of his suggestions was to read a lot of online magazines and news sources on technology. Jonathan Basker suggested Tech Crunch, Mashable, and a few other sites. This was a way to keep on the same page as everyone else when you went to meetups, cocktail parties, and classes. There was a technical writer who was asking about blogs. His response was to put as much as you can on the internet. People in startups want to see your Twitter, blog, and any other thing which you might have including Linked In. Internet startups want to see that you are using the internet. The talk seemed to cover the full gamut of places around New York. I even heard about New York City Resistor being a good place to meet developers. New York City Resistor is a place which I have meant to visit for a long time. I am interested in the relation between the Maker movement and libraries. There is a connection there. There was also some talk about places to learn about applying for jobs. The book What Color is Your Parachute was mentioned by Richard Bolles. I also mentioned the Five O'clock Club books. I think the people in the class were much more focused on reading online blogs and news sites than books. This of course is a bit different than the library setting. There was some mention of the Oreilly books being an excellent place to learn about programming. I follow Oreilly media closely, especially Joe Wikert's blog, Publishing 2020. Jonathan Basker talked about how there was a different set of expectations in hiring sales people than technical people. Sales people are expected to be much more forward thinking. I could relate to Jonathan Basker talking about how a person visited Betaworks unannounced. At one point, I went to New Work City to see how it worked. I also stopped by General Assembly to see what the space was like before I started taking classes. Another subject which Jonathan Basker touched on was cover letters and thank you notes. He said that you should send a cover letter of usually about two to three paragraphs. The cover letter should talk about how you can help the company you are applying to. He also mentioned that he very much liked the cover letters he got at Etsy. People would send cover letters folded up as origami and thank you notes in cross stitch. This added a nice ponderable touch to the talk. There was a question about internships. Jonathan reminded people that internships are not about getting coffee for people. A good internship should have people doing something constructive which leads to a good job. I asked about ways to train myself for startup jobs. Most of his answers seemed to be focused on programming and technology. I look at the startup jobs and wonder what I am doing sometimes because my skills seem not to match that many job listings. I am surprised at the limited amount of research, marketing, and customer service jobs listed at startups. On a very deep level this session about hiring made me rethink how I network with other people. It is quite difficult for me to ask people for contacts. I am not sure why. It just is. I seem to meet a lot of people, but find it difficult to ask for connections. I think this is true of a lot of people. I also think that I never really asked a lot of questions to the jobs which I have been interviewed for. This is something else which I have to think about. The process of negotiating about salary and asking about company backgrounds did not come up a lot. But, then a library is a very well defined place with very specific expectations. Jonathan Basker mentioned that he would possibly do a hiring for startups session as well. This would be equally fascinating to me. At the end of the session, I ended up talking to the iPhone application developer who was at the meeting about the changes which were happening in libraries. In libraries, many more people now have E-readers and want to learn how to use them, there is more programming, more demand for computer use and instruction, wireless access inside the building, less funding, and other things. I ended up suggesting that he might want to visit New Work City and New York City Resistor if he is exploring New York for computer people. I updated the Twitter and Facebook account for the library. I also paid my dues for the Westchester Library Association. The 2012 Conference is on May 11. Library Advocacy Day in New York is on March 6, 2012. Last night, I finished reading A Universe from Nothing. I learned that nothing is unstable and very easily becomes something in the quantum world and that empty space has lots of different energies in it. There is a sense that nothing is something in particle physics which is a rather odd thought. It was a nice way to stretch my mind a bit. I got an invitation to an online entrepreneurship class from General Assembly http://generalassemb.ly called Start Making. I am hoping that it is interesting. I also added this blog to Bing Webmaster Tools. I already have it on Google Webmaster Tools. It is sometimes interesting looking at the site links. I currently have 123 people following this site on RSS. At least another 200-300 people follow it on a daily basis, and another 99 people follow it through Google Reader. New York Public Library is doing an event on March 9, 2012 at 7:00 p.m. called Occupy Rousseau: Inequality and Social Justice. 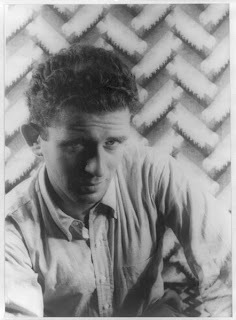 Norman Mailer, 1948, Library of Congress, Prints and Photographs Division Van Vechten Collection, reproduction number LC-USZ62-42506 DLC (b&w film copy neg.). This morning, I checked the Twitter and Facebook accounts for the library. 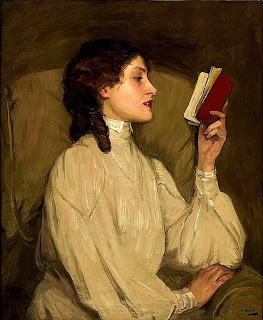 I am going to Literary Brooklyn tonight, an event that is listed on the New York Librarians Meetup at 6:00 p.m. It is at the Princeton Club of New York on 15 West 43rd Street. It should be quite interesting. The Princeton Club was a nice place. I checked my coat, kept my bag and went to the event. I was a bit late for the event, so I did not see everything. Evan Hughes was talking about the book, Literary Brooklyn: The Writers of Brooklyn and the Story of American City Life. He also had slides of many of the authors he was talking about; Pete Hamill, Alfred Kazan, and others. As always, this is my impression of what I heard and saw. It is also some of my personal commentary. The talk was entertaining. 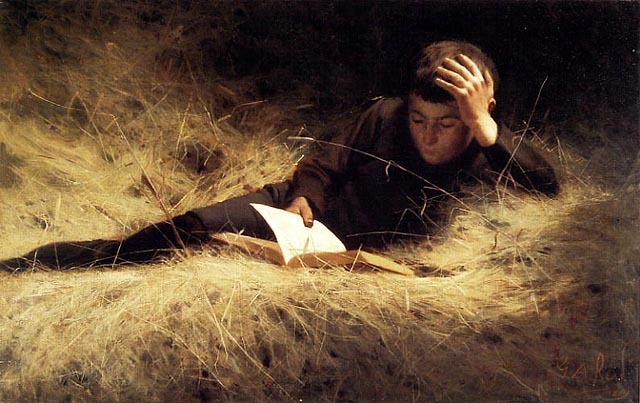 Each chapter he read from had a different set of authors and was in a different time period. He talked about Norman Mailer, Carson McCullers, Arthur Miller, and many important literary figures. Evan Hughes also tied the figures to the life of Brooklyn. He mentioned how different neighborhoods attracted different kinds of writers. Throughout the reading, he mentioned a number of different books, Bernard Malamud, The Natural, Chaim Potok, The Chosen, and February House by Sherrill Tippins were a few of the books talked about. I especially liked how Evan Hughes described how the New York Is Book Country fair faded out, then the Brooklyn Book Festival started up and grew. This very much reflects my own experience watching the growth of the Brooklyn Book Festival. There was a brief question and answer session after the book talk. Ethan Hughes answered a question about The Amboy Dukes by Irving Shulman, something I had never heard of before. He also talked about how Park Slope was starting to attract authors. I found the talk informative. On the way out, I noticed that Mobile Libris was covering the book sales. Ethan Hughes signed book after the talk was over. It was a very nice chance to see an excellent author talk. There was also a breakout after the event with the New York Librarians Meetup. We went to Starbucks and had coffee and talked about librarianship. 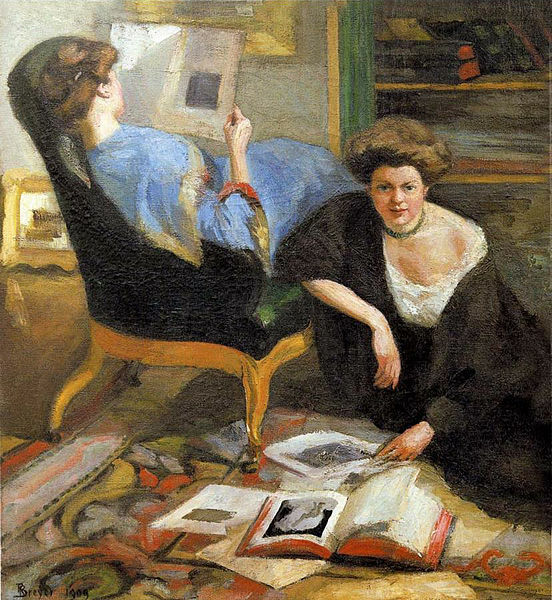 Two of the librarians were new to the profession. There was also some discussion of social reading tools like Shelfari, Librarything, Goodreads, and similar social reading tools. Some people use Goodreads as a way to generate recommendations for Readers Advisory. I spent some time talking with the group leader about resources. She suggested that I should look at Booklist, possibly join My Metro, and talk to the people from Urban Libraries Unite. She also mentioned that I might want to create an online portfolio which is different than a resume. 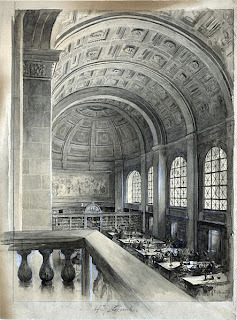 Illustration drawing shows the interior of the reading room of the Boston Public Library, Bates Hall. 1 drawing : wash, opaque white and graphite. Published in: "The New Building of the Boston Public Library" by T.R. Sullivan, Scribner's magazine, 19:88 (January 1896). As usual, I updated the Twitter and Facebook accounts for the library. I am putting together a personal card for myself. I have the design pretty much figured out. It will have my name, email, and skills. I intend to use Rockwell font, Bookman Old Style font, a black ornamental border, a small picture of an open book, and raised lettering on a creme colored background. I went and ordered the card in the morning. It should be coming in a couple of days. Tomorrow I am going to Literary Brooklyn at the Stanford Club. 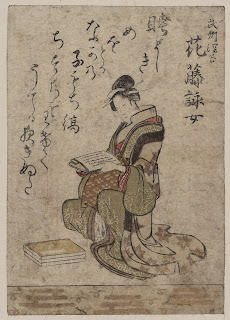 It is a program which the New York Librarians Meetup was invited to. I will probably end up writing about it. I have to dress a little more nicely for the program. This afternoon I read some of The Folly of Fools: The Logic of Deceit and Self Deception in Human Life. This book is about the psychology of self deception. It is about how we deceive ourselves with overconfidence, self inflation, and the illusion of control over things which we have no influence over. The book is quite ironic and a tiny bit sarcastic. It is an e-book which I downloaded to the Kindle for PC program. The space was very comfortable. The presenter mostly followed the slides. Once again, what I am describing is more a matter of my interpretation than what might have been said. One of his points is that SEO is not a new thing, and you cannot just use SEO to build a business. It is becoming increasingly hard to game the system with SEO. It is actually a considerable amount of work to build links. A lot of it is requesing that people link to you and finding out who is linking to you. Some of the objectives are to get bloggers and other people to like your site and link to back to it. This includes actively writing comments on places like Quora and Yahoo! Answers. I found Byrne Hobart's ideas different from what I was used to. He also talked about writing articles for other sites, inviting guest bloggers, and getting coverage from the media. He suggested that people build news around what they are doing and become a topic of conversation. He was talking about how to put links into articles that you have put on other sites and inviting outside people to link to your site. There was also a reminder to reach out to your old contacts so that they will follow you. I found the lecture interesting and useful. On the way home, I read some more of A Universe From Nothing. The author is writing about string theory and the concept of the multiverse. I read some more of A Universe from Nothing today. The author is writing about cosmology. The main focus is on the origins of the universe. There is a bit on cosmic microwave background radiation. I also updated the library Twitter and Facebook accounts. I took a look at my resume today. I have not felt a need to look at it for a year and a half. This morning, I finished reading The Lean Startup. Eric Ries describes a stock market with longer term investing and reminds us to waste less. I updated the library Twitter and Facebook accounts this morning. I am reading A Universe From Nothing, Why There Is Something Rather Than Nothing by Lawrence M. Krauss. This is a very philosophical book about cosmology focused on the physics of the beginning of the universe. 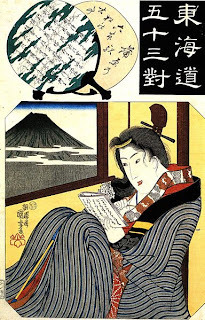 Hanafuji eijo Print shows Hanafuji Eijo, facing left, sitting, reading. 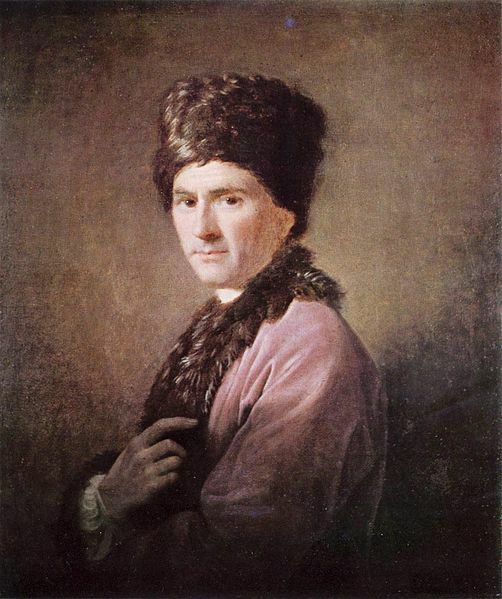 Between 1801 and 1805. I just liked the image. This morning, I read some more of The Lean Startup. I am going to pull a quote out of this book that I Found very interesting from P.116. "The rate of growth depends primarily on three things: the profitability of each customer, the cost of acquiring new customers, and the repeat purchase rate of existing customers." This shows Eric Ries's focus on customers. I checked the displays this morning and updated the Twitter and Facebook accounts. I also checked the gift books and turned in some paperwork. I am off next week which should provide a nice break. I spent some time sorting through the paper on my desk and filing things. There are two large bags of gift books which I have to check which are a mix of chick lit, mysteries, and romance. They are all recent books published after 2008 in excellent condition. The library aides are shifting and shelf reading the oversize books to make things a little more orderly in the stacks so people can find things more easily. On the way home, I almost finished reading The Lean Startup. On P.191 and P.192, Eric Ries identifies three tends that are happening in manufacturing. 1. Hardware becoming software, 2. Fast production changes, and 3. 3D printing and rapid prototyping tools. If we think of 1. Hardware becoming software in the book business, we are seeing how physicals book are increasingly being turned into e-books. We are also seeing some books being produced only as e-books. 2. If we think of fast production changes, we realize that books are now written and designed on computers. It is far quicker to get customer feedback. Many galleys for books are now electronic only. Library Journal recently created an alliance with Netgalley. Also, the e-book can come out before the physical book. 3. If we think of 3D printing and rapid protoyping, there is an emerging print on demand system for books where people can choose whether they want a paper copy or an electronic copy. I just downloaded The Folly of Fools: The Logic of Deceit and Self-Deception in Human Life by Robtert Trivers to my home computer. I took a break from reading tonight and watched some of Chuck Berry Hail! Hail! Rock N' Roll which is a biographical picture about Chuck Berry. Keith Richards produced the music for the film. It reminded me a bit of the book, Life by Keith Richards. I found it to be very relaxing. I also plan on watching another rock film, Bob Dylan Don't Look Back. 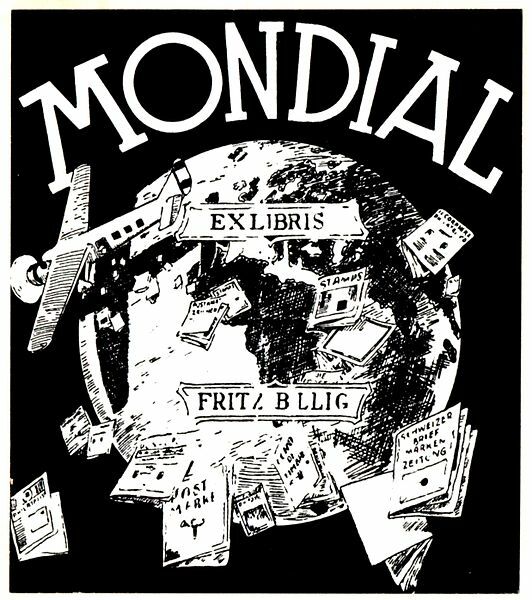 A bookplate for Fritz Billig found in a book by A.B. Kay published in 1908. Today was extremely busy. We had the computer lab from 2:00 p.m. to 4:00 p.m. and the Mount Vernon Writers Network which has a solid attendance. Things are moving along smoothly with these two groups. I have learned from watching the computer lab that it often takes more than an hour to fill out job applications or forms on the internet. This makes the usual amount of time given in public libraries not enough time to apply for jobs. I checked the gift books today. The Friends of the Library book sale is doing alright. There were a number of paperback thrillers to add to the collection. I got a call from Better World Books today as well. Better World Books handles our discards. The Mount Vernon Writers Network was interesting today. We discussed plans to expand the group as well as a bit on electronic publishing. I sent a reminder email to the head of our Friends of the Library Group and the Mount Vernon Writers Network about the different places where the library has social media on the internet. There is a new Gallery Exhibit Piecing It Together at the Mount Vernon Public Library. There is a film series featuring Denzel Washington's films on March 3, 2012 with an introduction and discssions on the films by Dr. John Howard. I read some more of The Lean Startup. I rather like the idea that the objective when releasing a new product is not to create something complicated, but to create something that can be easily improved upon and modified to meet customers wishes. I checked the displays and the gift books this morning. I also spent some time talking to people about programming today. Right now, the Computer Lab for Academic Use is running between 2:00 p.m. and 4:00 p.m. I am looking at the Library Journal Article , The Shape of Things to Come in the February 15, 2012 magazine on P.32. It reveals something that was told to me at Book Camp. There are over 100 different tablets, and 50 different models of superslim laptops. This means there is a tremendous proliferation of potential e-reading devices. The article says that E-readers may soon be completely replaced by multifunction tablets. It shows that the information and content may ultimately be more important than the variety of devices. In my opinion the software which go with the devices which can be used on a laptop or pc may last longer than the personal digital assistants as constant upgrades are introduced. I placed a hold on the book Arctic Rising by Tobias Buckell. 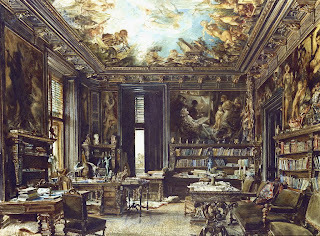 The office and library of the Austrian industrialist Nikolaus Dumba in his Viennese residence Palais Dumba, 1877 Rudolf Van Ritter. 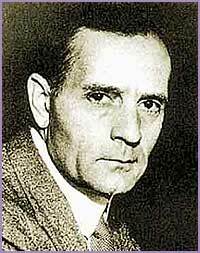 I am listening to Marc Eliot narrate American Rebel. He is both the author and the narrator. He adds a quality of both salaciousness and captivating rhythm to the story. Right now, the author is talking about Clint Eastwood in the television show Rawhide. I updated the library Twitter and Facebook pages. We have lots of programming today. We have the Biography Book Club, William Bowden reading from his poetry book Soul Sisters Sonnets II, computer classes, a bilingual Spanish/English storytime, and the College to Careers Program. It should be very busy. I checked the displays and gift books and made an announcement about programs today. The book, A Universe From Nothing by Lawrence M. Krauss with an afterword by Richard Dawkins came in for me to read. As usual, I have too much to read. The poetry program by William Bowden was fantastic. He started by talking about what Mount Vernon was to him and growing up. He gave a bit about his experiences with the Mount Vernon Public Library. He even had a few poems about education. Then he segwayed into a series of love poems, poems for his wife, and valentine poems which were very nice. It was excellent. He read poems from his books, Soul Sister Sonnets and Soul Sister Sonnets II both of which he self published. He is also a member of the Mount Vernon Writers Network. I was too busy to get a chance to read the latest Library Journal and New York Times Book Review which I will get to tomorrow. On the way home, I started reading The Lean Startup How Today's Entrepreneurs Use Continuous Innovation to Create Radically Successful Businesses by Eric Ries. It is about how to be innovative in a way that supports customers. The objectives seems to be to quickly find out what people want then make it for them. I have been hearing a lot about the idea, but this is the first book that I have seen that explains it. I attended the following sessions at Book 2 Camp. As always I am just giving impressions, not complete coverage. It is also my opinions which can be different at times. People hear and interpret things differently. I sometimes think differently as well. From 12:40 to 1:30 p.m. there was the session Should Ebooks Be Social? It was quite interesting.The presenters were talking about if books should be social. They were asking questions about whether you should share margin notes or tweet about books. The questions were focused on the subtext about books. I learned about several new potential tools, Readmail, Subtext, Book Pulse, Papas-- a tool for Twitter to excerpt portions of books. There was also mention of places like Shelfari, Goodreads, and Librarything. The group thought Copia and Bookglutton were too platform oriented and were not necessarily where the readers were interested in. The group was very focused on fiction, especially the public domain part. I am not sure this is the right approach. Practical books on business and other subjects and text books seem much more sharable because learning is generally more of a sharing environment than fiction. I tried to lead a session but people were not that interested. I talked to four people about Electronic Magazines and Newspapers in Libraries from 1:40 p.m. to 2:30 p.m. I got a few suggestions that seemed counterintuitive. The first was that I should focus on the software, not the hardware for devices like the Kindle, Nook, and Sony Reader. It would be better for us to have the Nook for PC, Kindle for PC, and Sony Reader software for PC on a laptop than the devices. The devices will go out of fashion very quickly. One of the people I talked to from Maz which is a beta for a new platform for creating open source magazines said he saw over forty different new E-reading devices at a conference. 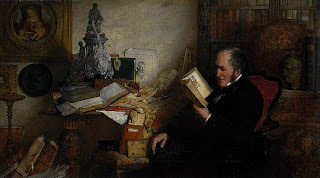 In his views E-readers were only going to proliferate. It was too early to know what was going to happen. There is an issue right now where companies are trying to sell a specific form of branded book inside their platform. Apple has Ibooks, Amazon has Kindle, and Barnes and Noble has Nook. Many people would like a universal set of software that would work on all their devices. It was an interesting experience. Next time I think I will just stick to going to the sessions. The next session which I attended was on E-books and Libraries from 2:40 p.m. to 3:30 p.m.
Again these are my own opinions and only a summary. Many people will disagree with them. I have my own opinions. I mentioned Freading as an example of a service that would allow people to download and keep books. The problem with this is that the library does not own the books. Many people seemed unsatisfied with Overdrive. There was talk of Douglas County which had created their own E-book lending system through the Colorado Independent Publishing Association http://douglascountylibraries.org/content/new-e-book-partnership They also use Overdrive, Tumblebooks, Gutenberg, and Freegal for downloadables. So it is an adjunct to an exisitng set of E-book providers. There was mention that the Kindle Lending Library seemed to actually be helping libraries with E-books. I mentioned that there was a lot of information on E-books and libraries. The problem was that it was fragmented. I can go to Teleread, the Digital Shift through Library Journal, Joe Wikert's Publishing 2020 Blog, Mashable, and many other places to find information on E-books. However, there is little cross referencing between articles. Also, because it is business focused, there are no bibliographies of articles, nor is there very deep analysis. The other issue is the cost of buying E-books. Penguin which is one of the six largest book publishers has pulled out of working with Overdrive. Overdrive supplies many libraries with E-books. There is a feeling of being locked in with certain vendors for E-books as well. There was a little bit of tangential talk about how libraries were underfunded. Libraries did not even have the staff to cover their book sales. For me this is very sad. Most library book sales are run by the Friends of the Library who tend to be the libraries first advocates. I see them as a way to generate intangible good will more than make money. In the same way, I think it is necessary for librarians to be active with their budgets and advocacy, even if it is not on library time. A library which is closed or underfunded will not keep librarians employed. .
E-books, new formats of electronic content, and new e-reader devices add additional costs to libraries that were not there before. The last session was on Indie2 Imagining the Indie Bookstore from 3:40 p.m. to 4:30 p.m. It was about imagining the Indie Bookstore of the Future. As always, these are my own reflections on what I saw. This was a very interesting and fun session. A large part of the idea in the group was that bookstores are third spaces where people meet for community, food, and people. There was an excellent reminder that in the future all bookstores will have bars in them. Also bookstores have cats. People wondered about how online could ever replace browsing for books. Most people thought that there would still be paper books in the future, 60% electronic and 40% paper. I think there will be less than this, but I also think there will continue to be a market for high quality illustrated fiction, graphic novels, and art books. One of the people at the conference mentioned that libraries may be the bookstores of the future because so many bookstores are closing. This was very much a session about ideas. It was quite imaginative. People were talking about how there might be a print on demand system in addition to an e-book system in the future bookstore. Also the future bookstore might run 24 hours a day, 7 days a week and serve as a social space where people would meet each other to talk about media. People would come for events like poetry or author readings. Another thought is that there very well could be a hybrid system where people embed electronics into books using a 3d printer. I can see a future where print on demand fuses with 3D printing to make something new entirely. It would be interesting to see a book with a steel cover, plant based plastic pages, and embedded electronics for music, images, and other things. Another idea was that there could be many more nonprofit bookstores as books are seen as an artistic and cultural objects more than commercial objects. In Canada, there are some libraries with bookstores in them. This can be seen as problematic because it competes with private enterprise. At the end of the unconference, there was a cocktail hour. Kobo provided the wine for the show. It was a nice chance to talk to people. It was far different than I expected, but I found it interesting. It is back to full circle where I mentioned a few people I talked to yesterday. This was the first unconference I have ever been to. The people who come decide the program. Someone gets up and announces what they wish to talk about. Then they write it down and put it in a grid so people can see what there is. After that people break into groups and go to the individual sessions which are very much about questions and answers and participation. I think there were at least three people that were from Library Journal at the unconference. The unconference seems like a prequel for many attendees to the Tools of Change Conference which is happening on February 13-15. There are other interesting events as well. It is Social Media Week in New York from February 13-17. 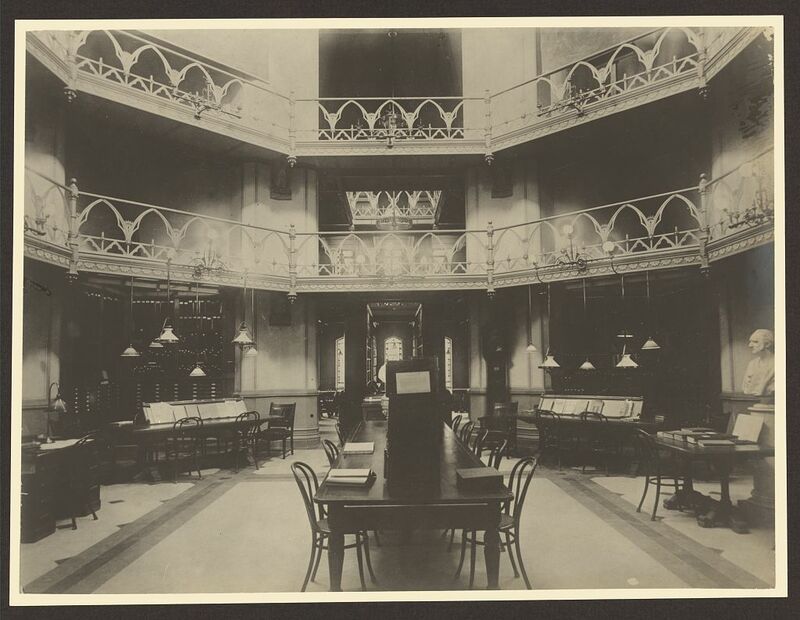 The Introducing NYPL labs looks quite interesting. This morning, I checked the Twitter and Facebook account for the library. I also listened to some more of American Rebel. I am enjoying it. There is a hard bitten, rough edge to the book. Clint Eastwood comes across as a womanizer, jazz lover, and character actor. I will be going to Book 2 Camp in a few minutes http://www.book2camp.org It was an interesting day. Far different than what I expected. In some ways, I think did not do that well. I tried to start an open session on electronic magazines and newspapers in libraries, but people did not seem to be interested. There was a small session on E-books in Libraries. Again, this was interesting because it seemed that there were more questions than answers. The setting was at New Work City which I happen to like a lot. I volunteered a bit in the morning for set up. It was interesting. The crowd was different than I expected. I found it a bit unusual. They had bagels for the volunteers in the morning. I wrote a few signs on what looked like giant post it notes and ended up moving some furniture. The coffee was decent. Coffee goes with books. I will write a bit on the actual event tomorrow. I have tomorrow off for Lincoln's Birthday which was today on Sunday, February 12. Personal effects of Brazilian writer Machado de Assis. He died for a century. 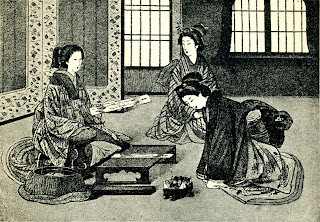 This image can be considered a derived work of public domain. I have been reading more of Thinking, Fast and Slow. I am learning that it is often easy to lose money in stocks because people have a hard time letting go of poorly performing stocks. They regret their losses and don't sell in time. I updated the Twitter and Facebook accounts for the library. I am going to the Book 2 Camp Unconference tomorrow which is free. I will probably go early to volunteer to help with setup. I am listening to Marc Eliot narrate the audiobook American Rebel: The Life of Clint Eastwood. It is a download from Overdrive. It is the first time I have listened to an audiobook on a computer. We are having the Biography Book Club on Tuesday from 3:00 p.m. to 4:00 p.m.. We are reading about a person in a current event. Clint Eastwood's recent superbowl commercial, Halftime in America was a bit controversial and in the news. I rather liked it. This morning, I read some of Thinking, Fast and Slow. The author is writing about how we overestimate the chance of a rare event happening like winning the lottery or getting attacked by terrorists. A lot of the lottery is about dreaming. A dollar will give you a pleasant daydream even if you win nothing. I have been working on my annual schedule for programming. The Adult Summer Reading program starts on June 25 and ends on August 10, 2012 with the annual End of Summer Reading Tea. I also have been looking at some of the other programs as well. I am thinking a little more about the Book Squared unconference. It should be interesting to attend. I spent some time updating the Facebook and Twitter account this afternoon and checked the displays. 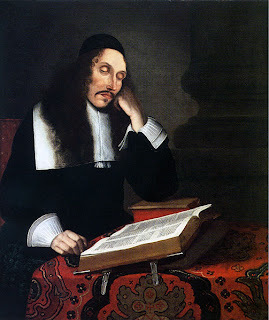 Portrait in oil of the dutch philosopher Baruch Spinoza by the painter Franz Wulfhagen (1624–1670) from Bremen, Germany. Created in 1664, probably commissioned by the scholar Johann Eberhard Schweling, the painting today is in private hands in France. We have the Computer Lab for Academic Use from 2:30 p.m. to 4:30 pm. I have been helping a few people with their email today. I put some books on collage, assemblage, and mosaic in the displays cases next to the art exhibit. We have quite a few oversize or quart art books. On the way home, I read some more of Thinking, Fast and Slow. Daniel Kahneman is writing about risk. He is describing why we fail to make bets based on probability and are likely to make huge disastrous bets when we are in trouble. I read some more of Thinking, Fast and Slow. Daniel Kahneman is writing about overconfidence in decision making. He is describing why people believe their small business will survive, or their stock pick will do well. He shows how people believe that they will do better than everyone else. This morning, I checked the displays and the gift books and updated the Twitter and Facebook accounts. I also worked on a flyer. We have the Computer Lab for Academic Use from 2:00 p.m. to 4:00 p.m. today. We have the Women's Enterprise Development Center today in the Computer Lab from 5:30 p.m. to 7:30 p.m. They are doing a session on computers for business. I also spent some time picking out books on collage, assemblage, and sculpture to display in cabinets or vitrines next to the Rotunda Gallery in case they are needed. On the way home I read some more of Thinking, Fast and Slow. The author is writing about loss aversion and how we value what we have more than what we plan on buying. I got a place at http://www.book2camp.org which is an unconference. It happens before the Tools of Change in Publishing Conference which is in the coming week which should be very interesting which is on February 13-15 this coming week. http://www.toccon.com/toc2012 Incidentally it is also the same week as the New York Social Media Week on February 13-17. http://socialmediaweek.org/newyork/ Social Media Week is mostly free. There is a session on New York Public Library's Social Media Labs. This morning, I read some of Thinking, Fast and Slow by Daniel Khaneman on the way to work. I just finished reading about regression to the mean in the performance. The idea is that over time our performance tends to average out. It shows me that in order to perform well, one has to improve ones basic performance. I checked the displays and gifts and updated the Twitter and Facebook accounts. 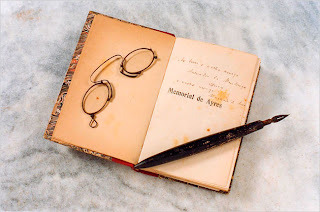 There was a copy of Love In The Time of Cholera by Gabriel Garcia Marquez in the gifts. There were a number of flyers to post on Facebook for events. I am getting a better grasp of how to do events at the library. I have been working with the board of trustees on this. The book, The Age of Austerity How Scarcity Will Remake American Politics by Thomas Byrne Edsall came in for me to read. I spent some time talking to people about programs today. I spoke with a gentleman named Kabiru Mohammed who self published a play, The Tragedy of Ethalia and a book of poems, Life's Passion. I also spent a few minutes talking to the Friends of the Library. 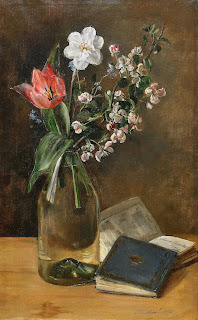 We have the Biography Book Club on February 14, 2012 from 3:00 p.m. to 4:00 p.m.. I have to pick out a biography of a person who is in the news to read. I think I am going to read about Clint Eastwood. I think I will read Clint The Life and Legend by Patrick McGilligan. I am a fan of Joe Wikert's blog and always his writing and perspectives. Occupy Elsevier A boycott of the publishing giant swells, but is the criticism warranted? This morning, I checked the Facebook and Twitter accounts for the library. I also checked the gifts and the displays. I usually read the news online to update the current events display. I read the latest New York Times Book Review and am starting on reading the February 1, 2012 issue of Booklist magazine. I called a few people about programming and returned the microphone to the business office. So far, it has been a very mundane day. I also spent some time writing up the monthly statistics for programming. It has been a not too exciting day. Our statistics are steadily rising. I continued reading Thinking, Fast and Slow. Daniel Kahneman is describing different mistakes which people make psychologically when they are making decisions. We learn about anchoring statements and different ways our emotions can override our ability to think clearly. There are examples of why we fail with statistics because of our personal preferences and other logical fallacies. Some of it can get a bit confusing. The book challenges how you think. Photo of Edgar Bergen and Charlie McCarthy from NBC Radio. They are reading an NBC-produced comic book, On the Air, which told the story of what happens behind the scenes in radio broadcasts in a children's format. Press Release October 8, 1947, Public Domain. I am planning on going to a New York Librarians Meetup. I have been extremely busy lately. This one is for Literary Brooklyn at the Princeton Club of New York on Tuesday, February 21, 2012 at 6:00 p.m.. I rsvpd and will have to dress the part. Evan Hughes will be discussing his debut book Literary Brooklyn: The Writers of Brooklyn and the Story of American City Life. It should be a nice chance to meet with colleagues and hear an author talk. I spent some more time reading Thinking, Fast and Slow. 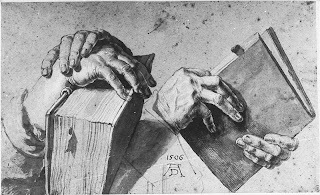 The author is writing about pattern recognition or the human tendency to seek after patterns even where there are none. I also took a break from reading and watched Shaun of the Sheep which is humorous claymation. It is by Aardman who does Wallace and Gromit. I also watched Wallace and Gromit A Matter of Loaf and Death which has a nice sense of humor to it. This morning, on the way to work, I read some of Thinking, Fast and Slow. It is about decision making. I learned that if you have any easier name for people to understand for your company it is more likely to be invested in on the stock market. People seem to prefer what is easily understood or recognized. This morning, I updated the Twitter and Facebook accounts for the library. I also checked the displays and gifts. 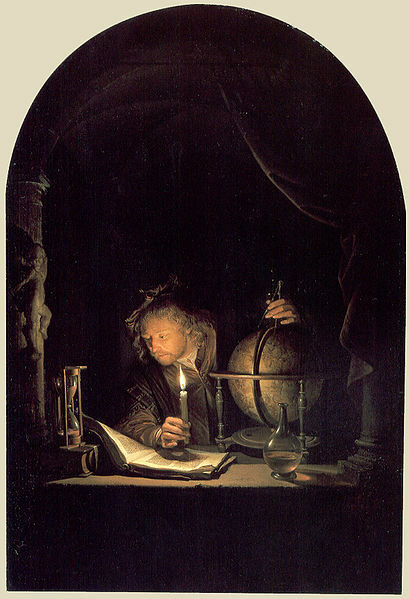 It is the first Saturday of the month, and the library is open right now. On the way home, I read some more of Thinking, Fast and Slow. The author is describing how we tend to confirm our own biases and often not think clearly when we are too comfortable. This is called confirmation bias. He also describes the Halo Effect where we tend to attribute more positive things to a person if we already like them. This morning I checked the Facebook and Twitter accounts for the library. I also checked the displays and the gift books. A patron came and asked about the computer lab and the community room which I showed to them. Tomorrow we are having a presentation by Shen Yun Performing Arts from 2:00 p.m. to 3:00 p.m. in the community room on Chinese Classical arts. I have been preparing for this. I also have the February Forecast from Baker and Taylor which lists a lot of the forthcoming titles. I got an offer for a review copy of Hide Me Among The Graves by Tim Powers. 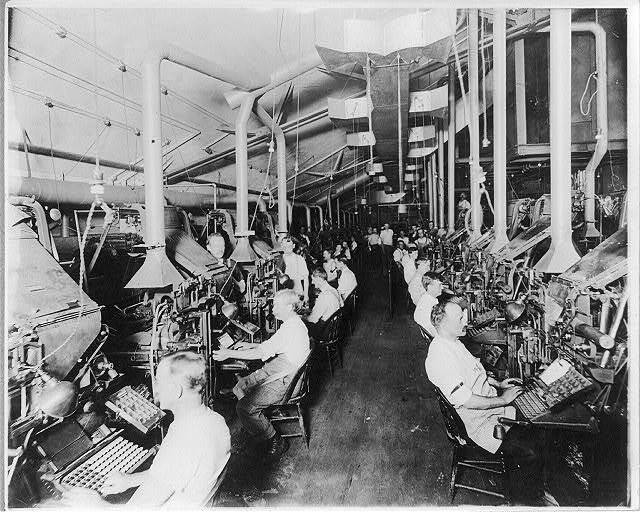 Newspaper publishing - N.Y. Herald: Composing room and linotype machines Date Created/Published: 1902. This morning I read a bit of Fab on the way to work. The author is describing additive manufacturing as well as different creative uses which people are putting fab labs to use for. He describes how people design things so they can be taken apart as part of the initial creative process. This morning, I checked the displays and updated the Twitter and Facebook accounts for the library. We had the computer lab open from 2:00 p.m. to 4:00 p.m. today. I helped a few people with their email and helped a few people apply for jobs. We also have the Women's Enterprise Development Center tonight from 5:30 p.m. to 7:30 p.m. they are doing an Enhanced First Steps Program for entrepreneurship. I am speaking to the teacher about the computer lab. She also teaches the computer classes. I got sent a box of Advanced Reading Copies from Library Journal today. I got Bridge of Scarlett Leaves by Kristina McMorris, Wildflowers from Winter by Katie Ganshert, The Widow of Saunders Creek by Tracey Bateman, The Grievers by Marc Schuster, Make It Stay by Joan Frank, Isaac A Modern Fable by Ivan G. Goldman, Fallen Angels by Connie Dial, and Flat Spin by David Freed. It is always nice to get these books. It reminds me of why I am a librarian. I finished reading Fab on the way home. I enjoyed reading the book because it was essentially about a new kind of innovation. People were adapting manufacturing to their unique wants and needs in unique places. I especially liked the examples from India. It makes me want to read more about the Maker movement. I spent some time looking at the Community Calendar on the Mount Vernon Chamber of Commerce. Quite a few of the libraries events are listed there. On the train to work, I started reading Thinking, Fast and Slow by Daniel Kahneman. It is about the intersection of intuition versus reason. There is a lot in this book which covers how we make decisions. I also updated the Twitter and Facebook accounts this morning for the library. I checked the gift books this morning and the displays and contacted a few people about events. The Central Library District orders for test books have come in. It should help our Job Information Center. Jack Kerouac has a lost novel which is coming out in March 2012 called The Sea is My Brother. It is his first novel. We had the Computer Lab for Academic Use today from 2:00 p.m. to 4:00 p.m.. Some people were practicing from Tuesday's computer class and a few people were looking for jobs. Tonight we have The Women's Enterprise Development Center from 5:30 p.m. to 7:30 p.m. doing an Enhanced First Steps for Small Business Program which is focused on entrepreneurship. The book Fab The Coming Revolution On Your Desktop-- From Personal Computers to Personal Fabrication by Neil Gershenfeld has come in for me to read. It should be quite interesting. I started reading Fab on the way home. It is a bit different. The focus is on personal fabrication; producing things that you have always wanted to produce, but were not available as a mass manufactured item to your specifications. I rather like that the systems being designed at the MIT Fab Labs are open source and flexible.